Thinking about things (sometimes via an utterly non-sequential, circular mix of substructure, infrastructure, postulation, sentiment, nostalgia, artifact and documented observation) can be an exercise of ‘living with the questions’. 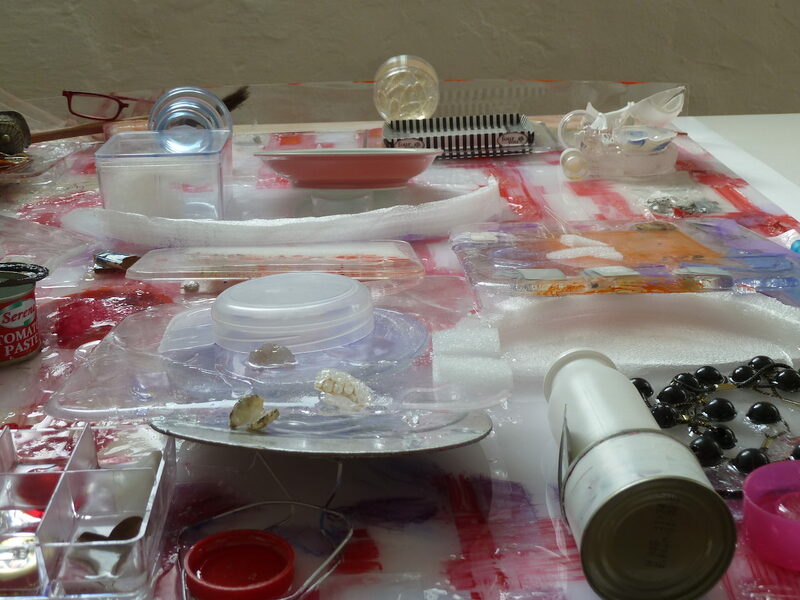 This takes open-ended time: a waiting and watching until eventually ideas coalesce into a form. One just has to believe in the process of sitting it out. In putting together an exhibition of this scale one factor is the cumulative image collection that speaks to art history, the history of objects and the history of personal objects. 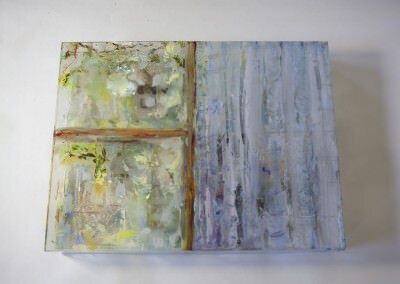 The boundaries between these factors seem to be fluid and I sought a way to contain that fluidity in a way that embraced both the fugitive and transient, and the history of small things. The thesis of the solo show was about life and the lived life of the artist becoming part of the actual medium of the painting. 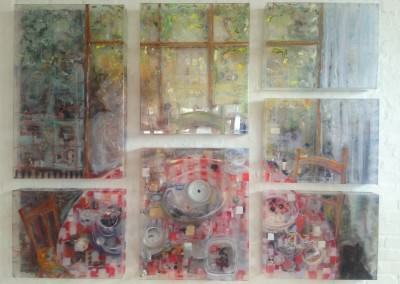 This was a painting about this particular and personal domestic life. 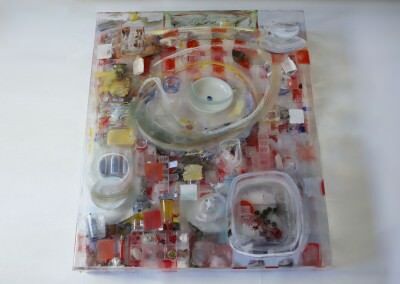 In this work, I set about moving through a mass of sentimental, hoarded or alluring objects, both personal and commercially available and ‘metabolizing’ them by ordering them into one work. 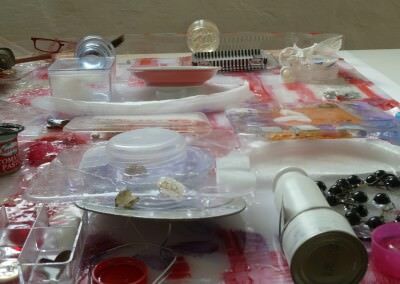 I wanted to paint with the objects, but it was also a way of putting them ‘away’ from me. 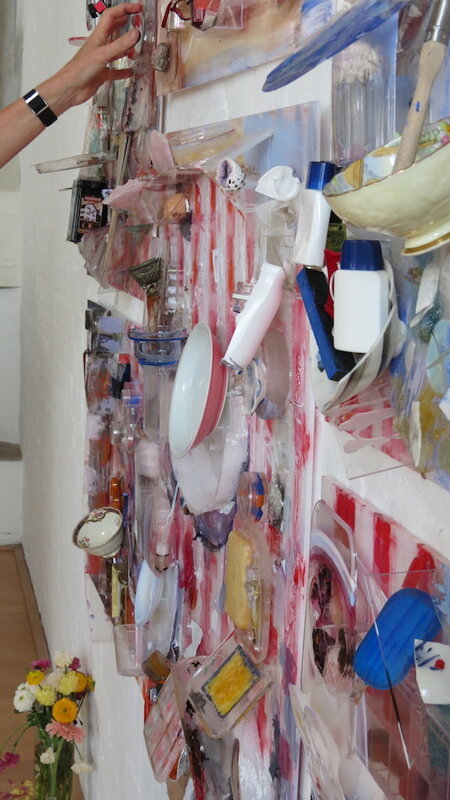 And so I embarked on one major work (which I came to see as a potential folly) – and eventually called ‘the Large plastic’. I viewed it as a ‘thinking’ process piece. 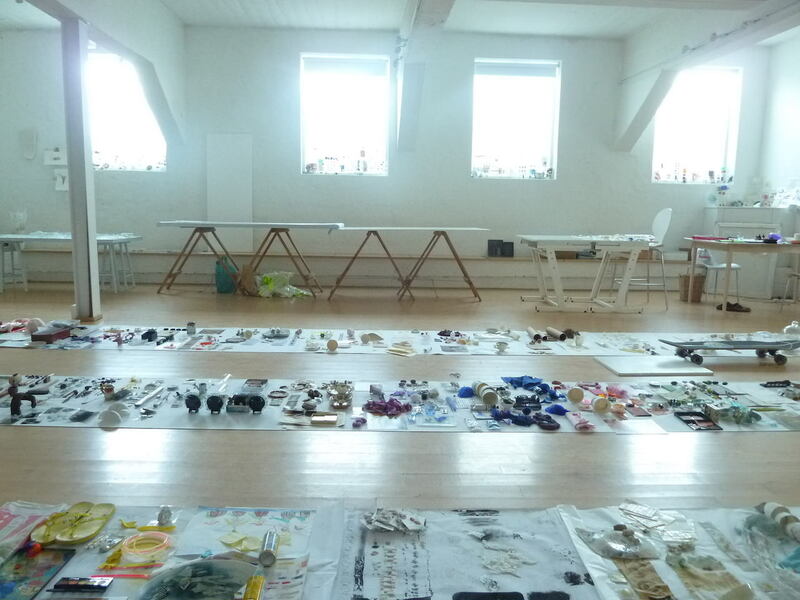 I asked myself what might happen if many different objects, all with very different qualities, possibilities and resonances were combined into a single art work. 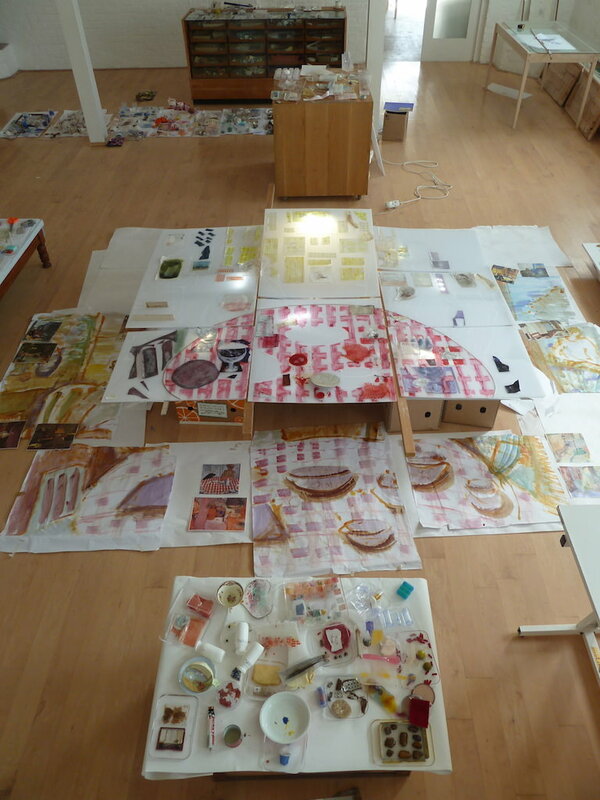 I began simply by sorting hundreds of household and other objects through the colour spectrum. I was thinking of the activity of thought being a precursor to the physical activity of creating; how thought orders life, art-making synthesizes perception and art in my opinion, often predicts life. Meaning is what we are making. 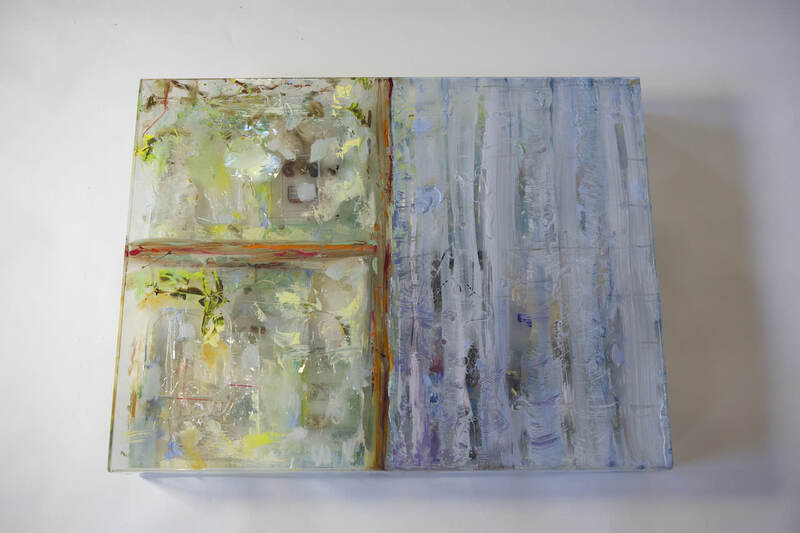 This work was displayed in the open studio space which occupies the length and breadth of the home above it. The show had two aspects. 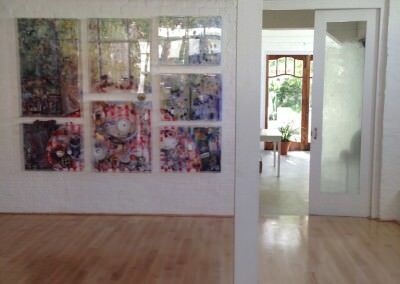 An installation in the home and this one work in the large airy space below it. I was still balanced on a chair when people started to arrive for a private party upstairs, as I wrestled with my inner critic and steadied myself for the outer ones too. I told myself that this was research. The only thing required of me was to take each step as it presented itself and live with each new question as it arose, while bearing in mind the original question/s that had given birth to this entire project. What is the difference between all the layers of perception and organization that we use as frameworks for understanding life? We all choose or are taught various beliefs or creeds which we live by, despite their misfit or inadequacies? Why do we generally only perceive one layer at a time? In what ways do we frame things to make them more manageable? As we flit from screen to screen in our blossoming virtual world, do we modify our way of looking at life? Can we as a species live more comfortably these days with open-ended frames of reference? … and as I infer with the title of the show ‘ THIS PERSONAL AND THIS PARTICULAR’ every part of domestic life is valid as significant subject matter. Here in the humble every day one finds a very real register of life. History, politics, economics, environmental problems and new perceptions in the world of science on the ‘grand scale’ play out in the domestic realm eventually. The fluid state of being human at any given time, on the individual scale, reflects the prevailing context in interesting ways. 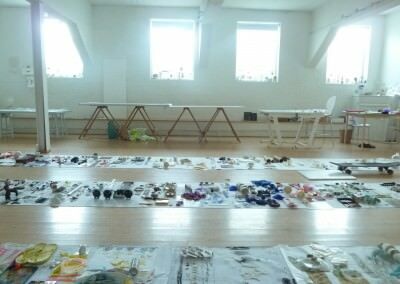 believe), pencil crayons, a Rubik’s cube, feathers, soap, my significant porcelain shards, netting, notes, failed sketches, a silver salt cellar, plastic, spectacles, stained glass splinters, acrylic and oil paints, paper, screws , wood and tins. These are all assembled and enclosed within the seductive modern injection-moulded plastics – all ranking together. How to make an object at peace with itself? 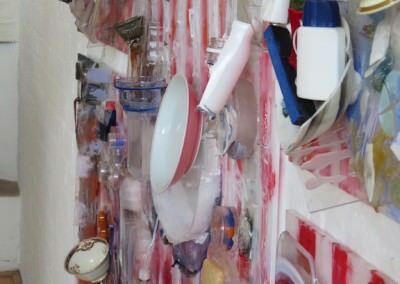 It was a nod to the qualities of the art of painting that drew the thesis of the whole show together, and in particular informed ‘The Large plastic’. 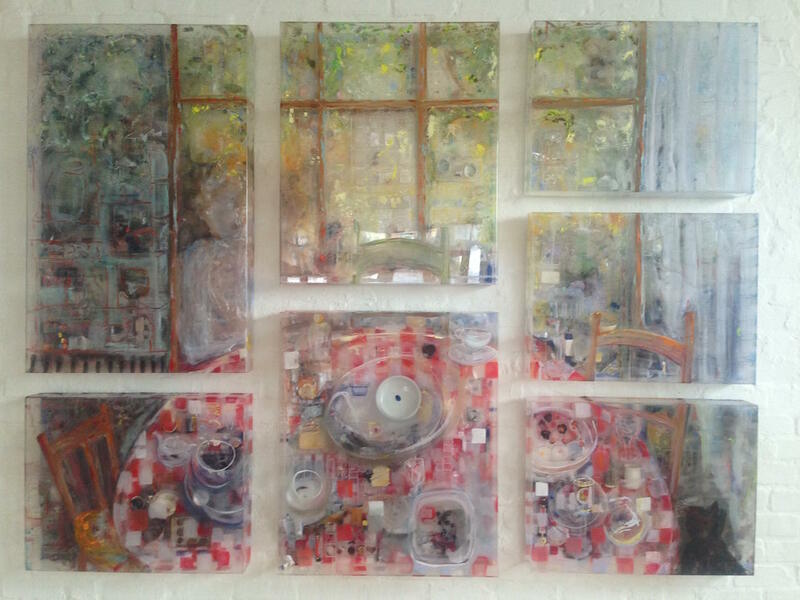 I was influenced specifically by the domestic interiors of intimist painter Pierre Bonnard which I refer to explicitly, in order to hold the glittering Perspex image. One of the paintings with the emblematic ‘Red Checkered tablecloth’ was painted in 1917, the same year that my young South African grandfather (aged 17) would have been fighting in the trenches in France. He was close by to where Bonnard spent those same years painting a world very different from the horror that was unfolding so close by. 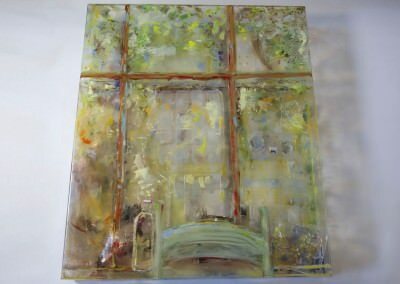 Bonnard’s work at that time was overshadowed on the world stage by conceptual works like Duchamp’s Fountain and his later works dealing with advances in scientific thought. Bonnard’s art making was to do with the devout business of being human and domestic and he achieved a sensibility, redolent with loss and nostalgia and with the poignancy of transient lights shining on moments of daily life. His works have proved to be a lasting endowment and testimony to the love and pathos of life. 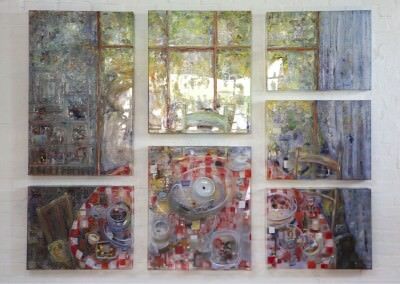 In the same way as I appreciate the intention and focus of Bonnard’s work, I think about how to live productively with anguish, angst, freedom and the limitations and abundances of contemporary life. 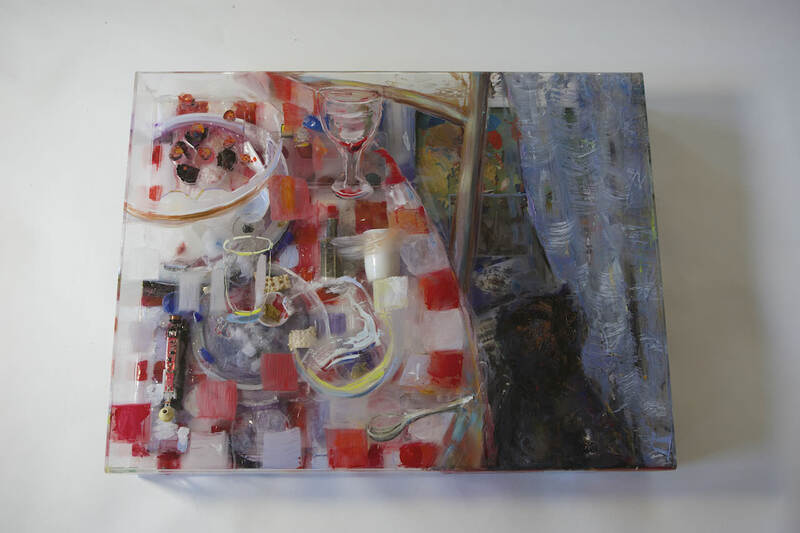 Working as I did with a mix of objects, precious, cherished and otherwise, and aiming for a quality of reverie and reverence for the daily, I needed all of this to be coerced into the quality of a painting which was looking forward and sideways, but also into the past. 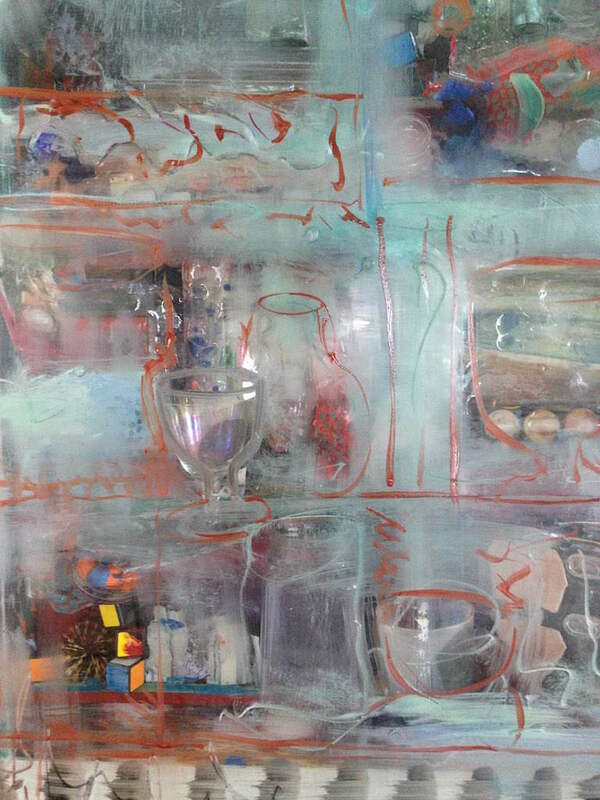 The end result glittered harshly; the mix of plastics and Perspex, polyurethane resin, and acrylic paint was uneasy. 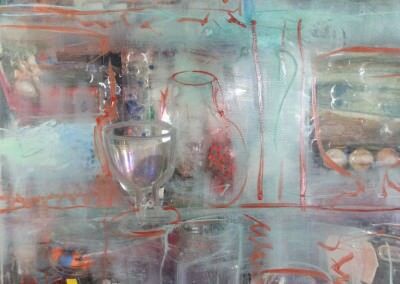 From a distance however, the work played with the ambient light in the room and with the glinting objects arranged beneath the reflective surface of the Perspex frame. 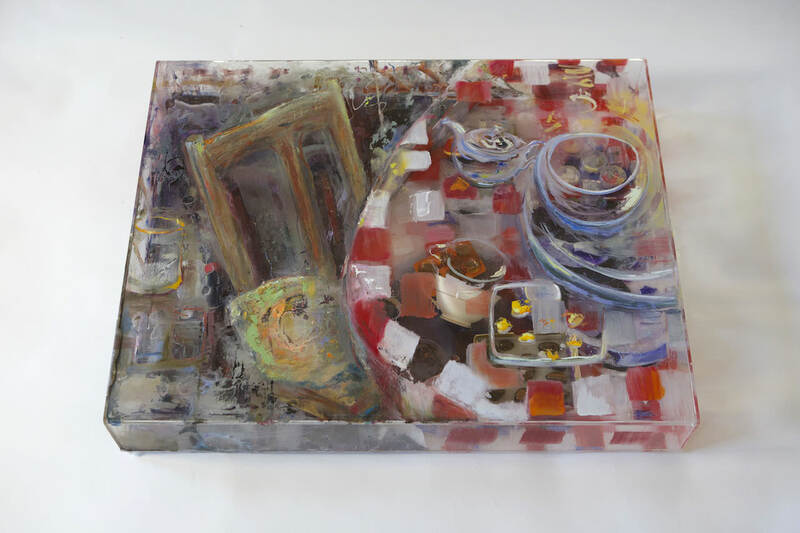 The work altered with the moving sunlight throughout the course of a day and the sense of a table and the seated presence of a woman was abidingly apparent . 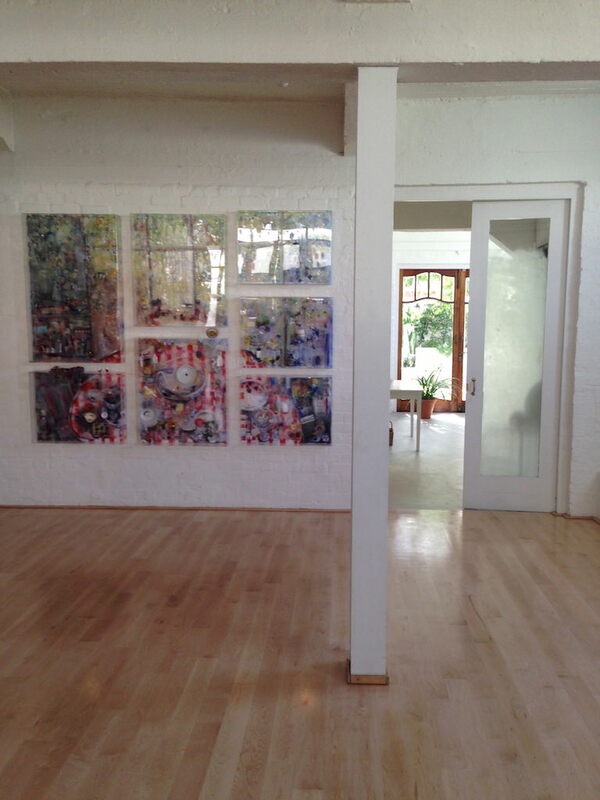 The work beckoned, calling for close scrutiny. People lingered around its edges and moved slowly along its length as though reading a text. 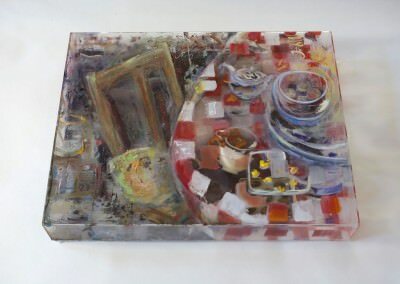 After a while of living with the work, I found myself scrubbing at the smoothness of the superimposed resin boxes with sandpaper and a small power tool. I put a clear bowl of water on a sheer Perspex plinth in front of it to invert the image and to soften the air. The bowl of water seemed to me to be the real painting that I had been aiming for. 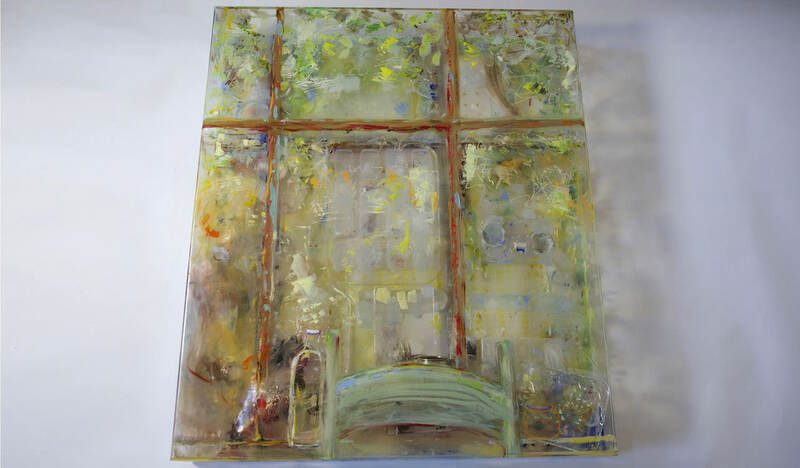 Three months after the show ended, I started to paint with oils on the surface of the Perspex frames too. 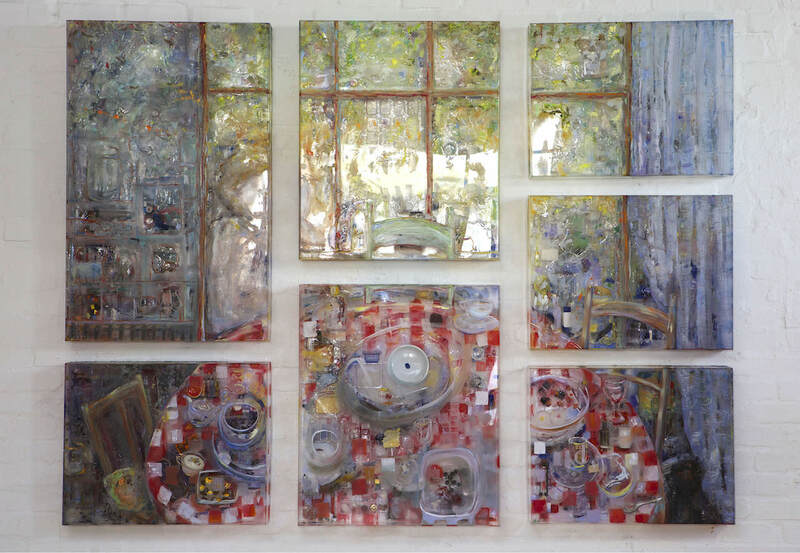 The work came full circle in that it was the gentleness of a painting and my idiosyncratic brush strokes , and the softer colouration gleaned from hours of studying Bonnard’s interiors which brought the work into a visually manageable and more coherent form. 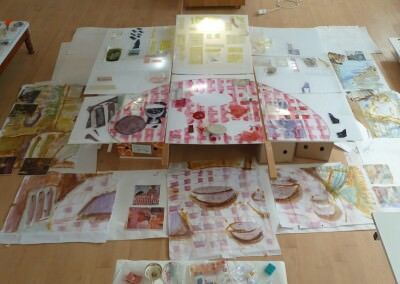 It was an act of story telling and of completing a process of distancing, reflection and recreation.